As at February 2010 a lot of work has been going on. The Essex Biodiversity Project has heath and acid grassland as one of the top priorities for the county. Home to many rare, specialised and endangered species, acid heathland has been declining for many years. Recently Tiptree Heath restoration has been completed, and that is now on an ongoing maintenance plan. Layer Breton is a much smaller site of about 30 acres. After the fire in 1976 (before that the heath consisted mainly of grass, bramble and gorse with very few trees), trees have grown rapidly, shading out other plants and also depositing leaves which increase the richness of the soil. That in turn enables the stronger plants, including grasses, to out-compete the very specialised heathland plant species which thrive in poor soil conditions. The intention for Layer Breton Heath is to restore a significant amount back to acid grassland, while retaining woodland and several large areas of scrub. One of the problems is that most of the trees and gorse are the same age, about 34 years old, dating back to the 1976 fire. Thus all are at the same level of maturity, whereas many animals need a range of ageing plants in order to feed, breed and shelter. Gorse, for example, needs regenerating over 5 to 10 years. It is growing well along the northern roadside, especially as it now receives full sunlight. Compared to how it looked after the recent water pipeline work, it is already looking very good. Birch trees have a life of about 70 years, so many of these are now in middle age. Those along the roadside north of the church were thinned out several years ago and are now fine specimens, whereas others left unthinned are weak and spindly and will never make a good tree or a good habitat. Whilst many of the specialised heathland species need poor soil and open spaces, we also have a population of birds and some mammals such as rabbits. Rabbits can do a lot of damage, but they are a vital part of the ecosystem; they keep grass low and their droppings are used by minotaur beetles (we have one of the largest colonies in the borough). The beetles move about better on short grass. Rabbits, other small mammals and birds need plenty of cover, so we need to create and maintain some large areas of really dense scrub. Those areas will grow up to perhaps 15 feet high, and then at a certain time trees will begin to shade out the dense undergrowth and the ground cover will disappear, leaving the birds and animals with nowhere to go. Not only birds, but beetles, spiders, butterflies etc all need specific habitats and food sources, and many of them are interdependent; lose one link in the chain and it all collapses. So we need not only to create large scrub areas, but to ensure that there is a continuous supply of them, so that as one area ceases to provide cover, another is there to take over. Essentially this means allowing several large areas to grow up in succession, and to cut down those that are losing their ground cover. This is probably something that needs to be done every 10 to 15 years, depending on how it develops. Cutting down such an area will allow it to regenerate, and may also involve coppicing as well as removing some of the more vigorous growing plants. School pupils have been to the heath to observe, carry out surveys and to help sow heather seed. 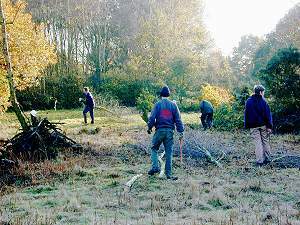 Many working parties have been organised over the years in conjunction with the British Trust for Conservation Volunteers and have been well supported by local residents of all ages. Presentations have been made to the Parish Meeting, the most recent last November when the wider-reaching Essex Living Landscapes project was also presented (this latter has been presented to our three parish councils/meetings within the last 3 months.). Specialists from Essex Wildlife Trust and the Essex Biodiversity Project have attended parish meetings and also made presentations to our gardening club. Our local heath is a scarce and precious resource. If we sometimes feel that we live in a small and overlooked rural community, seen by some as out of touch with modern life, even more so does that apply to the rare heathland plants and animals. We cannot just let them slip away. They are now totally dependent on our assistance to survive. If they have a voice, then we will only hear it by feeling the effects of the loss of many rare species. No amount of recycling or reduction in our carbon footprint will contribute anything significant to saving this place. We are not of necessity on a mission to save the planet here, we are simply being good neighbours to nature. Nationally heathland is increasingly scarce, as are many species of plants and animals which depend on this rather special environment The heath is not only home to many plants and animals, but it is also an area used and enjoyed by the public for many years. The laws of nature, and the laws governing people's behaviour concerning the heath are both quite complicated, and this article aims to explain the main ones simply. However, common sense and courtesy to others have always gone a long way in achieving a happy balance between the various interests, and should continue to do so. Who owns the Heath, and What Laws apply? "It is a popular misconception that commons are public land. While some commons are owned by public bodies such as local authorities, most are owned by private or corporate individuals. In legal terms the owner is often referred to as the owner of the soil since there are often also owners of other rights over the land (such as sporting rights)"
- fall foul of any statutory restrictions concerning common land, such as the Law of Property Act 1925." Layer Breton Heath is owned by an individual, Mr Mark Relf, Lord of the Manor. The heath is "common land", which means that people have the right to use the land, but only for very limited and specific purposes. So what are these rights? Well, everyone has a right of access for the purposes of "air and exercise", or to ride a horse across it, but not to drive vehicles onto it, or to camp or light fires [Law of Property Act 1925]. Certain owners of property in the village are registered as having other rights, for example to graze a specified number of geese or cattle on the heath [Commons Registration Act 1965]. The owner has power to negotiate other rights, provided they do not infringe existing commoners' rights. Because of the importance of heathland it is also subject to conservation laws passed by Parliament. Such sites have various technical designations. The heath is registered as a SINC (Site of Interest for Nature Conservation). [SlNC Ref M4 Page 56, National Grid Reference TL 945187]. SINCs are in the process of being designated as County Wildlife Sites (CWS) which is a local authority designation. The heath is also shown in the proposed Local Plan for the Borough, as part of a Countryside Conservation Area which also includes the reservoir and surrounding areas. It is also referred to as degraded heathland in the Countywide BioDiversity Action Plan. How is the Conservation Work managed? The DETR Good Practice Guide provides guidance on preparing a management plan. With the assistance of Colchester Borough Council, a Management Statement has been prepared. This is a broad policy statement covering matters such as Woodland and Trees, Heathland, Ponds, Paths & Rides, Car Parking, Grassland. This provides the framework for a Management Plan. The Management Plan takes further guidance from a Botanical Survey commissioned by the Borough Council and carried out in 1998 by a professional botanist with extensive conservation experience, assisted by Colchester Natural History Society and the Museum Resources Centre. The Plan contains a brief description of each major pathway and each area between paths (called a "compartment"), together with notes on the work required. Although the fieldwork was completed in under two weeks, the Report identifies over 40 birds, 60 beetles, 40 other invertebrates, 22 butterflies and many plant species. Mammals were excluded. Detailed botanical information and broad guidelines for work, are contained in the Survey. The full Management Plan will have a life cycle of perhaps 20 years. That is required in order to manage trees, whereas shorter cycles are appropriate for other work. Based on the plan, specific tasks are prepared for the volunteer workforce, and for professional contractors where appropriate. Most conservation work is carried out in the winter months, when flowers and grasses are dormant, small animals such as beetles are not active, and the larger animals such as birds are not breeding. Some tasks such as grasscutting do however need to be done at other times of the year. 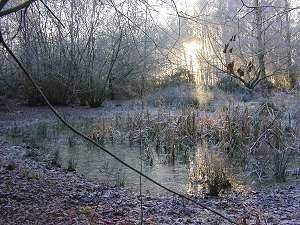 For the first season, 1998/99, work was carried out by the Colchester branch of the British Trust for Conservation Volunteers (BTCV), with local people assisting. In the summer of 1999 a local BTCV group was set up and has worked closely with the main Colchester group during the 1999/2000 season; some work has been carried out by the local group, with larger tasks involving both groups. The number of local people helping often equals the number coming from outside. This level of local commitment is important as it enables the village to have a sense of involvement, and it also encourages volunteers from outside by showing them that local people care for the heath. In the first two years, the priority has been to reduce the fire risk by widening the main rides or paths which are overgrown with brambles and scrub, to eliminate the highly invasive Japanese knotweed from the northern roadside and to preserve relatively rare features such as the small pond. At the same time part of the older gorse has been cut down to regenerate and tree cover has been reduced to allow more light in to that gorse. Gorse should be maintained on a 3 to 5 year cycle, providing a range of habitats for wildlife. When widening the rides, care has been taken to 'scallop' the edges, i.e. to make them very uneven. This reduces the un- natural 'Motorway' effect, and provides a far greater length of scrub margin (with a wider range of conditions -sun, shade, etc) for wildlife. We have also brought more light and warmth into the small pond area by creating a south-facing bay; with the removal of some of the many small birches we hope that the scrub and gorse will regrow and provide a windbreak on the west. All this work is relatively easy to plan and execute, and allows us to gain experience and more detailed knowledge of the areas. For example, we are gathering detailed information on the birds and their habitats, so that future work can preserve them. As work proceeds, we are also improving public access. The car park area at the north-east corner on the Layer de la Haye road has been levelled and cleaned up so that less visitors park on the verges and there is less accumulation of rubbish, and access points and guidelines will be provided for local horseriders. Many smaller paths are maintained simply by walkers using them, and these have been trimmed back where, for example, brambles have made them difficult to follow. With the passage of time, the Plan will be extended to cover longer term conservation, for example to see whether heather will return to the heath, to encourage more wild flowers, and to manage the oak and birch wood areas. In preparing and updating the Plan, there are guidelines available through, for example, the Essex Biodiversity Action Plan - Heath and Acid Grassland, and the DETR Good Practice Guide. We are fortunate to have two experienced botanists living locally who not only comment on and assist in executing specific work plans, but are able to extend and update the 1998 botanical report through observations over a far longer period of time. They also write regular and non-technical articles for the parish newsletter. Work plans are discussed with the Colchester Borough Countryside department and with BTCV. The BTCV also provides comprehensive guidance at the practical task level, including a series of guidance notes and a range of training courses. BTCV also arrange meetings where similar local conservation groups can meet and exchange information. How will the Heath Change in the Long Term? Following the cessation of grazing during the post-war period, and the disastrous fire in 1976, much of the heath has gone through a period of succession; scrub and gorse have grown, squeezing out smaller species such as grass, flowers and heather. Thousands of birch trees are now well on the way to shading out the scrub and gorse, and following them are hundreds of small oaks which will eventually kill the birches. All these trees are also removing an enormous quantity of water from the ground, making the drought of recent years even more effective in eliminating many of the older damp-loving plants. At the moment, the heath has a very varied range of habitats. It does not seem possible to restore it to the full open heath that existed 50 years ago, and without the grazing it is difficult to see how that might then be maintained. So the plan is to keep the balance much as it is today, and to improve various areas for specific types of plant and animal. The main rides and paths need to be wide to provide firebreaks and to counter the invasion of scrub. Certain areas of open grassland need to be managed as wildflower meadows. Any wet areas or ponds need to be encouraged by removing excessive shading and intrusive growth of saplings. The birch trees are beautiful, but they should be prevented from killing other species, and they therefore need removing from certain areas. Likewise the oaks need to be controlled. Whilst certain areas should be retained as oakwood, very few of those oaks will ever develop into large stately trees. Examination shows that they are too close together and many have weak multiple stems and are prone to rot. Therefore those trees, according to experts, are unlikely to have a lifespan of more than 20 to 30 years. It may therefore be sensible to identify a number of good specimens and encourage their growth, while reducing others. Such a reduction in the leaf canopy will encourage woodland flowers and scrub cover for wildlife. Meanwhile, birch and oak will be springing up in other parts of the scrubland, and the cycle will repeat itself. What About Public Access and Information? We do not want to surround the heath with barrier posts and noticeboards. There are, at present, walkers, dog-walkers, horse riders and children. They all have the right to "air and exercise". The heath is not a very big area, but there should be room enough for everyone to enjoy it, and preferably to say 'hello' at a safe distance rather than avoiding others. Horses can cut up the paths and may frighten walkers, dogs can worry horses, and walkers sometimes com- plain about the mess that dogs make. Children get up to all sorts of adventures, not always popular with the wildlife, but provided they take their litter home with them it is good that they are able to enjoy themselves. A few cars still park on the verges, though most now use the car park. So the car park has been improved and perhaps a plan of the heath can be provided there. There is horse access at the side to avoid cutting up or fouling the car park surface, and guidance notes will be written by and for horseriders; riders have asked for this. Although a limited amount of horse usage is beneficial to the habitat, the riders are uncertain how best to avoid causing problems to others. Most parents act responsibly to ensure their children behave reasonably. The parish newsletter will continue to provide articles on the heath, and hopefully a short month-by-month guidebook can be developed. Finally it is hoped that as many people as possible will become involved in the conservation work, as that is an excellent way of understanding the value of the area and of what needs to be done to maintain it. We have already staged two days when organised educational activities for children run alongside the conservation work, and we hope to provide occasional guided walks for anyone interested. If you need to know more, or are interested in helping or participating in activities, contact the secretary of the Layer Breton Heath Management Committee, Geoff Russell Grant on Colchester 330235. • Our Heathland Conservation Work.